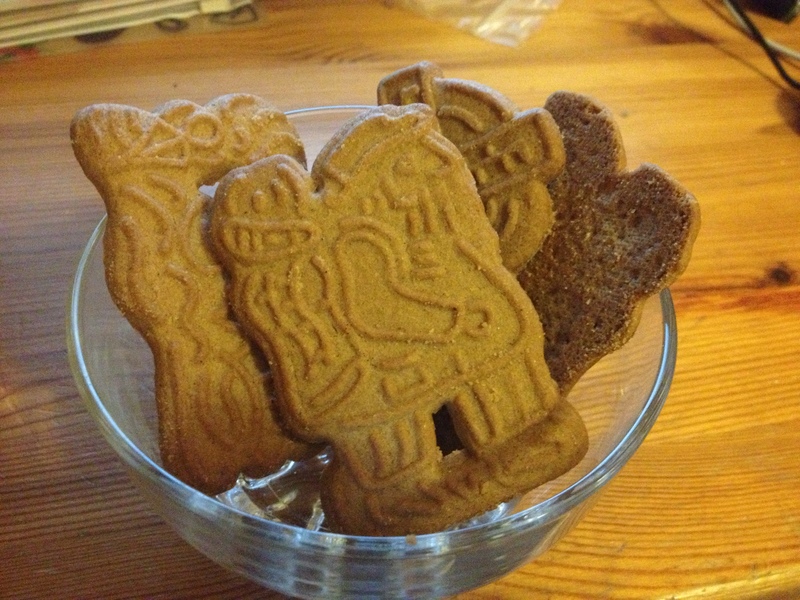 Speculaas, Spekulatius or Spéculoos, depending on where you are from in Europe, are traditional spiced biscuits made to celebrate the Feast of St. Nicholas at the beginning of December. They are made with a specific set of spices (known as Speculaas Spices) which bring warmth and sweetness to the biscuit. I love the combination of cream and ginger and spice, so here’s a lovely dessert that’ll be a simple yet elegant showstopper at any seasonal feast. Take your ginger biscuits, and break down in to crumbs. It is easiest to do this in a ziplock bag with a rolling pin. Wrap the bag in a tea towel first to prevent the bag splitting. Melt the butter in a pan, and add your Speculaas spices and mix in. 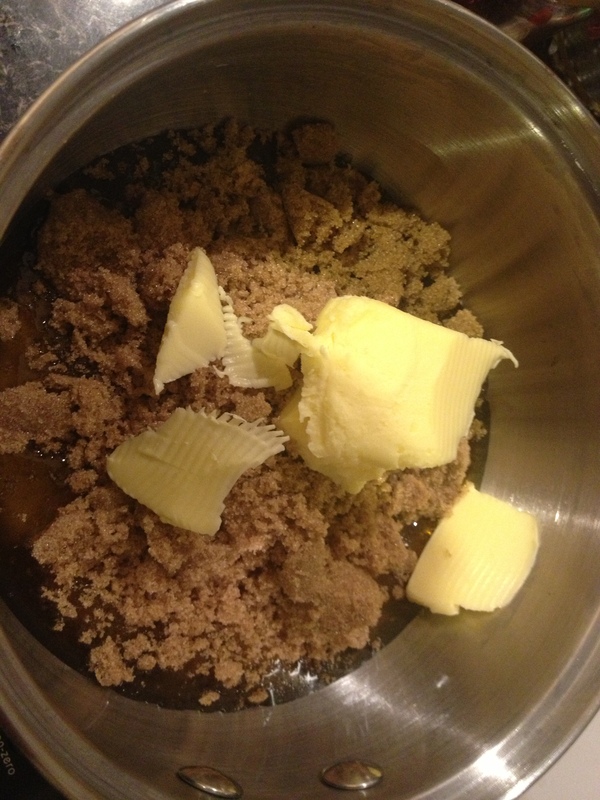 Then add the biscuit crumbs and mix through thoroughly until the mixture is uniform. This mixture will be your base. Press the crumbs into the base of a greased 9inch springform or loose bottomed tin to form the base of the cheesecake. Pop it in the fridge to cool and set. In a mixer, or with a handheld electric whisk, combine the cheese and mascarpone. Whip until light and aerated. Sieve your icing sugar and whip into the cheese mix bit by bit. Finally, add your vanilla and do the same until you have a fully combined, fluffy mix. Spoon your mix into the tin on top of the crumb base and gently spread out, smoothing the top with a spatula or palette knife. Set in the fridge for at least 4 hours before serving. Are you going to make this treat soon? Be sure to tell me how you got on! I love gingerbread in all its forms, but I’ve never posted a recipe for the treacly, cakey variety. That is all about to change. 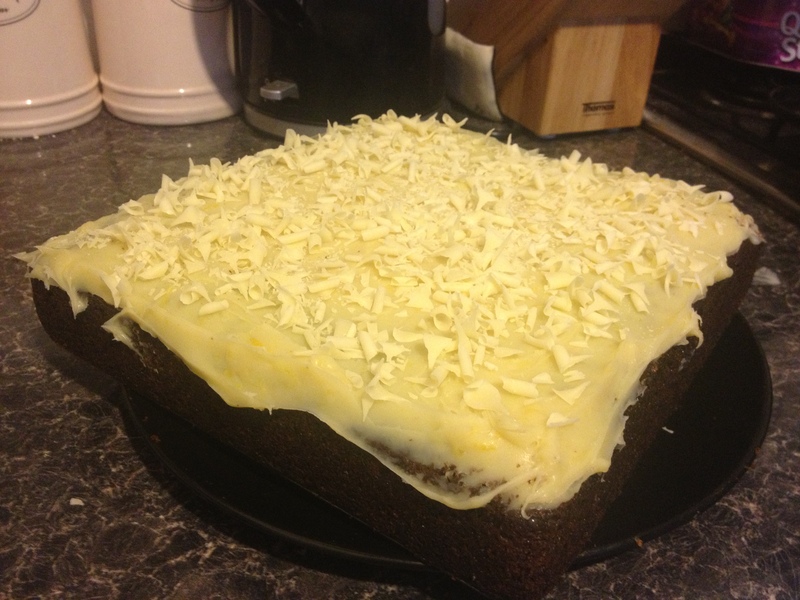 I have been making this cake since I was a student, and it is sticky and filling and satisfying and, just, yum. Topped with white chocolate ganache flavoured with lemon, and it’s a truly special treat. If you aren’t a fan of fruitcakes, you could even use this recipe as your ‘christmas cake’- dust the finished product with icing sugar to imitate fresh fallen snow, and decorate as for a snow scene! The first step is to make your ganache. If you just want to cover the top of the cake, then you need 1 quantity. If you want to cover the whole cake, then make two. Instead of adding liquor, you can either leave the ganache as it is, or flavour it with lemon zest and/or lemon extract. Don’t use lemon juice, as the acid will affect the consistency of the finished product. Now, for the cake: Melt the butter, sugar and treacle together in a milk pan over a low heat. Set aside to cool for 15 minutes or so. 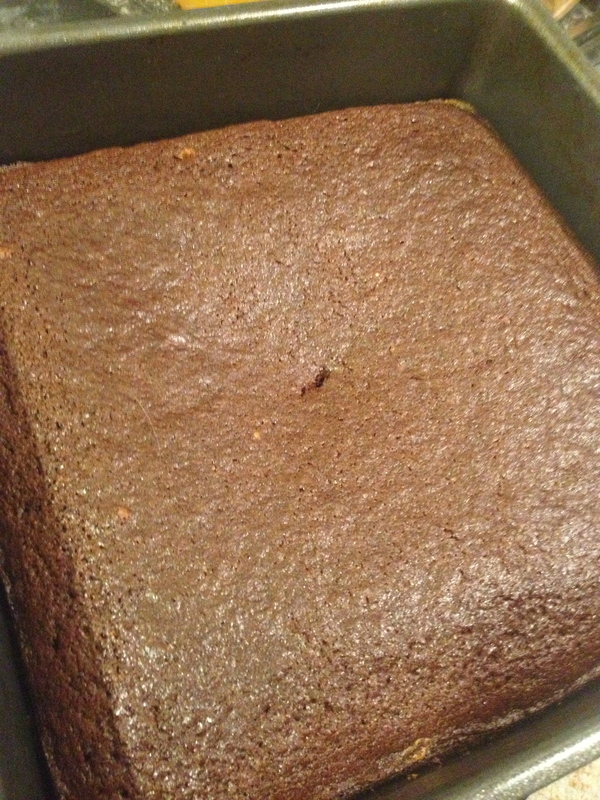 Preheat your oven to 170 c and grease a 9×9 cake tin ready for the baking. Mix together your dry ingredients in a mixing bowl. I use a whisk, as that what there is no need to sieve. Stir in the milk, then the egg, then the butter-sugar-treacle mixture and mix everything together gently, and pour out into the tin. Bake for 30-40 minutes at 170 c. Check at 30 minutes. Let the cake cool completely, then ice with the ganache and decorate as desired. Store in an airtight container or in the fridge. If you do want a fruitier twist than just the lemons, peel, core and cube a couple of eating apples and treat them with lemon juice, or acidulated water. These can be mixed in to the batter with everything else. I personally like my gingerbread unadulterated, but ginger and fruit are a match made in food heaven. … Und alles gute zum neuen jahr! It’s a no brainer; the Germans do Christmas well. With their Weinachtsmarkt, gluhwein and delicious edibles like stollen, they tick all the boxes for me: great shopping, delicious drinks and good eating. I come from German stock on my mother’s side, and whilst it hasn’t played a too overbearing part on my life, I think around the festive season certain aspects of it have always shined through in the feasting and libations. Every year we would get these delicious German christmas biscuits called Pfeffernüsse, a tradition I still maintain, and I can’t help but get excited when I see them in shops come autumn time. My favourite German christmas treat however is a similar creation to those ‘pepper nuts’. Europe is awash with gingerbread recipes, each country having its own version or versions with different textures and spice blends. Lebkuchen, which I have often heard called affectionately (if incorrectly) ‘Liebkuchen’ are my favourites. They burst with spice and pepper heat, plus a heady fragrance of citrus and honey. This year I’m using this gorgeous wholemeal plain flour from Otterton Mill in Devon, which I picked up on holiday. Good wholemeal plain flour really does add a depth of colour and flavour to biscuits, though of course if you are cooking a paler treat such as a sugar cookie, the bleached stuff is probably going to give a more convincing finish. I highly recommend raiding your local market or farm shop for produce from your local mill. This recipe makes great biscuits, large or small, and excellent edible Christmas decorations. So long as your house isn’t damp, and you can keep them away from hungry mouths, they don’t tend to stale either, meaning decorations put on the tree before Christmas can be scarfed down on twelfth night and still pack a flavour wallop. In a medium to large saucepan, heat the honey, sugar, butter and juices until dissolved and melted accordingly. Allow to cool until warm. While your mix is cooling, weigh out all of the dry ingredients (from flour down on the list above) and either sieve or whisk together to combine and roughly remove lumps. Whisk your eggs, then beat them into the honey mix. Add your zests and mix in. About a third at a time, add your flour into the honey-egg mix and stir together, adding the next third when the dough begins to look wet again. Grease a freezer/food bag and spoon in the dough. Age the dough in the fridge for 3 days. If you can’t wait that long, at least leave it alone for one day, for the flavours to develop. Roll out the dough fairly thickly (approx 1/4 inch thick) and cut out your shapes. If you want to make these into Christmas ornaments, use a drinking straw to poke a hole in the top of each design. Lay out your cookies on a baking sheet. These biscuits do spread and puff up, so leave at least 1/2 inch between them, ideally a whole inch. This also means that once they are baked, you will have to rewiden the holes for the hanging string. Bake at 170-180 c for 7-9 minutes until lightly golden. If you bake them darker they will still be delicious, but they will lose the chewy consistency those biscuits are famous for. Once cool, thread through ribbons/string if required and decorate with royal icing and non pareil, dip in dark chocolate or simply enjoy au naturel. These biscuits pack a flavour wallop. You MUST include the pepper as it takes the flavour to another a level. Another word to the wise- I have tried substituting golden syrup for the honey, and it just isn’t as good. Make the effort for this treat, and grab a jar of the good stuff. Making this treat makes me smile from start to finish. The delicious honey-lemon smell of the first step warms and soothes the senses, and the puffs of joyful spice as you mix the dough fill the air with festive cheer. Even decorating them has a huge place in my heart; traditionally you would find me with a tray of biscuits and icing equipment, in front of the television on Christmas Eve, watching the carols and singing to myself whilst given reindeer harnesses of icing and silver balls. If you like this recipe, why not try the other european gingerbread recipes I shared last Christmas; Polish Pierniczki and Swedish Pepparkakor? Mid-december can be a bleak time. The cold has really dug its claws in- I had to scrape my car free of frost today at midday! The shops and high streets are heaving and if you haven’t done your shopping yet, you’re seen to be leaving it late and the pressure starts to mount. Calendars are getting booked up faster and faster until you find yourself having to schedule a few hours at one event before switching over to the other one it clashes with, not to mention the after-party you’ll have to go to following that. Family Christmas gatherings are in full swing, and the stress of justifying your life choices of this or all years, or keeping your head down, or not throttling your over-achieving second-cousin-thrice-removed who is showing you up yet again, frays the best of us. If you find solace at the bottom of a glass of mulled wine, go right ahead. You’re not alone, and tis the season, after all. Me, I do a like a tipple, but of an afternoon, when I’m staring at my ever growing to do list, nothing is more perfect than a cup of tea and a good biscuit. Homebaked, of course, are best, and since it’s the season of sugar, spice and all things nice, Pepparkakor really hit the spot. Swedish gingersnaps first became part of my baking sphere back in 2006, when my lovely swedish chum Becka, then President of our university choir, suggested we bake Lucia buns and Pepparkakor for a fundraising Christmas bake sale for the students’ coach to our Easter concert at Snape Maltings. On the last rehearsal day before our Christmas concert, the student choir members entered the rehearsal hall in darkness, each carrying a candle and sang the Swedish carol Sankta Lucia in thanks to our non-student members. In the break we sold the gingersnaps and the saffrony traditional Lucia buns (Lussekater) for donations, and brought in the season with the best of cheer. It is one of my fondest university memories. Becka now has moved back to Sweden, and I’ve long since graduated from university and bought a house over a hundred miles from my old stomping ground. Munching on Pepparkakor and singing along to the radio on a frosty afternoon is as close as I come to to that lovely memory. Knowing that it is the season of giving, if you have vegan pals you like to bake for, or you yourself are dairy free, this mixture works well with Viltalite or pure or other vegan spreads. You can also replace the flour with gluten free or rice flour for gluten free folk, though I tend to find you have to give gluten free doughs and pastry more elbow grease than gluten-full mixes, and let them thaw a little if they turn to stone in the fridge, which they can also be prone to. Add the spices and baking soda, then mix in the water. Yes, really! Finally, add the flour and bring the dough together. You will need to work it, first with the spoon and then with your hands. It will come together into a gloriously perfumed golden dough. Either wrap the dough or cover the bowl it is in in foil and allow the spices to develop for at least 12 hours in the fridge. When the dough is aged, remove from the fridge and roll out nice and thin. It should be thinner than a pound coin- these are ginger SNAPS, after all. Cut out your cookies and place on a greased baking sheet. They will rise and spread a little, so don’t put them too close- a centimetre gap in each direction should be safe. Bake in a preheated oven (200-225 centigrade) for 5-8 minutes, depending on how your oven behaves. I baked mine for 6-7 minutes at 200. Cool on the tray for five minutes before transferring to a rack. Store, as for all biscuits, in an airtight container. The biscuits have an almost flaky texture when fresh baked- so light and crisp it’s heavenly. The cardamom hit is wonderfully different and leaves an aromatic sweet after taste. You may find, depending on your taste and how much of a punch your ground cardamom gives (the older it is, the less strong it will be) that you wish to reduce the spice to 1.5 tbsp per batch. However, I’ve had no complaints, and they go down a treat with a cup of Blossom Earl Grey or Vanilla Chai. And, as with all Christmas Gingerbread, a little bit of white royal icing will make the delectable and irresistibly festive. Or, Merry Christmas, depending on your native language. Yes, it’s December once again; decorations are going up, lights are being turned on, and suddenly the forgotten seasonal spices have been brought out of retirement to reign supreme in the kitchen. Every year about this time, bakers everywhere go into overdrive, or meltdown, depending. My festive repertoire keeps getting more extensive as the years pass and I add new recipes to my folio and friends and family put in requests of their own. This year, my first in my new home with its lovely big kitchen and snug, homey lounge, is no different; I’ll still keep everyone well stocked in mincemeat and pies, chutneys and pickles, biscuits, chocolates, petit fours and cakes well into the new year, as well as greedily stuffing my own chops. Well, tis the season, after all. I’ve been making Lebkuchen for several years, as I’m from German stock on one side, and I still love to make the chewy, pillowed honey, citrus and spice biscuits to decorate the tree and duly scoff. However, on the other side I’m Polish and proud, and for some time I’ve craved exploring the Polish traditional bakes, as I know full well that they, as for most central/eastern europeans, are Christmas mad. I’ve found more recipes than I’ll manage this year, and loads of ideas that filled with with seasonal glee, but this one couldn’t wait, not for a minute more than necessary. I used ad verbatim Ren Behan’s family recipe, but there are lots of slight variations out there. Preheat your oven to 200 celsius, adjusting for the behaviour of your particular oven. In a milk pan, melt the butter, sugar and honey together into a glorious dark brown syrup. Mix the dry ingredients together before mixing in an egg. 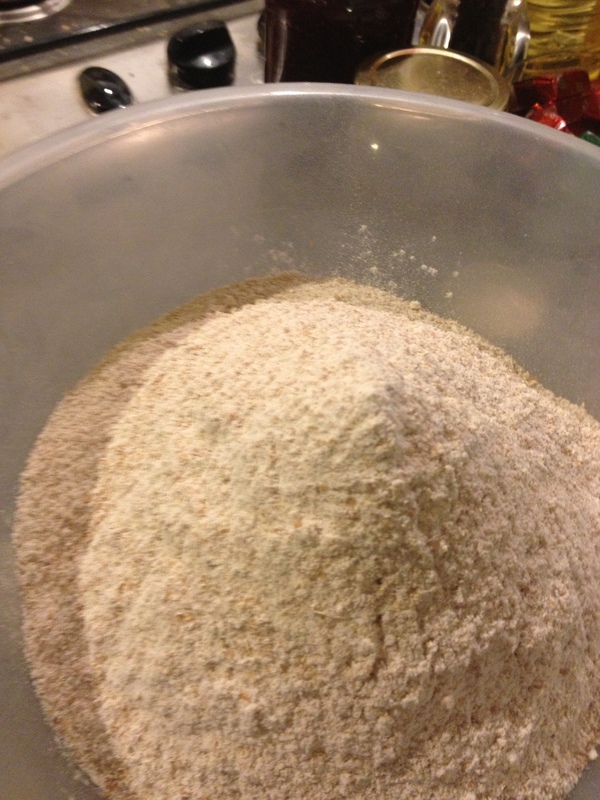 Pour the honey mix into the flour mix and stir together until a dark brown dough begins to come together. Tip it out onto a floured board and knead it into a dough. I found the dough sticky so have plenty of flour on hand to work in. Roll the dough out to the thickness of a pound coin and cut out your shapes, transferring them to a greased baking sheet (I use Fry light). As per Ren’s instructions, you’ll need several- I used 5, but mine are quite small. Bake for 6-8 minutes, depending on your oven. You don’t want them to colour too much. It’s a common misconception that gingerbread is gingerbread is gingerbread. When it comes to continental national variations on a theme, nothing could be further from the truth. Lebkuchen, Germany’s answer, is chewy and puffs up in the oven, and is heady with citrus flavours. Pepparkakor from sweden contains little ginger, but will blow you away with its exotic cardamom taste. Pierniczki are darker than these, less fiery than Pfeffernüsse and lacking the citrus. They don’t rise much, holding their cut shape and when fresh, a wonderful snap. 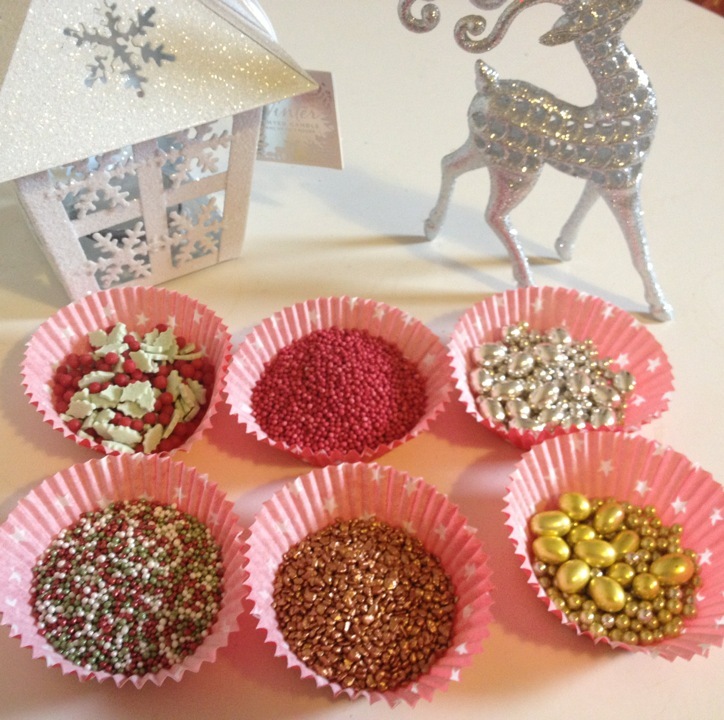 If you don’t give these a go, for decorations as per Ren’s website, or just to eat, you are missing out. I’m hooked, and they taste, bizarrely, incredible with the Spiced Apple Juice I make. Yum! The full photo set is up on Tumblr. I’ll see you again soon with another festive delight no doubt!